Internet provider BT has today launched a new Smart Hub (aka – HomeHub 6) wireless router for subscribers of their ‘Infinity‘ superfast broadband (FTTC/P) packages, which offers improved WiFi performance, built-in 4G filters and other enhancements. But G.fast integration will have to wait. 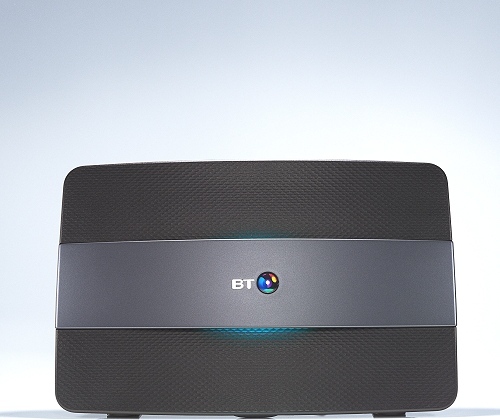 It’s been three years since BT’s retail division last introduced a new router during July 2013 (here), which saw their HomeHub 5 (HH5A and HH5B) enter the market alongside support for VDSL2 (FTTC) “fibre broadband” connections, Gigabit LAN (Ethernet) and the once still cutting edge 802.11ac WiFi (2.4GHz up to 300Mbps / 5 GHz up to 1300Mbps). By comparison the new Smart Hub enters into a different market, one where BT has recently merged with mobile operator EE and are on the cusp of rolling out their next generation of 300Mbps+ capable G.fast and FTTP broadband technology to 12 million UK premises by 2020. Suffice to say that their hardware needs to evolve. In keeping with that the new Smart Hub claims to offer the “UK’s most powerful wi-fi signal” and “unbeatable wireless range“, albeit only compared to routers from other major broadband providers (no evidence is provided to support this claim). The specification clearly suggests a powerful device with very good range, not least thanks to its 7 antennas, modern chipset (Broadcom 63137, 4366, 43602) and built-in filters that automatically block interference. We understand that in one very specific test the new Smart Hub was able to connect (WiFi) with a Laptop that sat some 500 metres away, albeit with only a single wall in the way (we don’t know the exact specifics). Mind you such results will always vary depending upon the device being used. NOTE: Regarding the 4G filters, these protect the 2.4GHz wi-fi receiver against neighbouring signals above and below the wi-fi band which can desensitise or “deafen” a standard wi-fi chip. This is more of a protection against future deployments (e.g. 4G at 2.3GHz) as these bands are not heavily occupied, yet. The router, aside from offering the latest version of Smart Wireless (this automatically checks for and selects the best wifi channel), also includes the similar sounding Smart Scan technology, which allows the device to “proactively monitor and improve [the] customers’ Wi-Fi performance in the background“. Many high-end routers include similar features. The Smart Hub is also designed to be small enough to fit through “most” letterboxes (241.9mm wide x 156.6mm high x 32mm deep), which means that you don’t need to be home in order to sign for the delivery. However it’s bigger than older hubs, not least to help it accommodate all of those extra antennae and other bits of technical wizardry. Naturally the very first BT Smart Hubs will be made available for existing BT customers from this Summer 2016 and we’re hearing that some new orders are already including the device. In particular existing BT Infinity subscribers will be able to get the kit for free by re-contracting, or they can buy one for just £50 inc. VAT (at retail it’ll be more like £129). Some may have been expecting the device to include integrated G.fast support too, but that would be too premature. Openreach initially intends to adopt a two box solution, like earlier FTTC deployments. In other words, you start with a separate G.fast modem (plugs into your Master Socket) and then that connects into an ISP supplied router like the Smart Hub (the WiFi improvements should be a big help here). No doubt we will eventually end up with a single G.fast router, but not right away. The other feature notable for its absence is BT’s femtocell style 4G technology, which might have been used to improve indoor mobile reception and to help off-load mobile traffic to the fixed line service in order to cut costs / improve the customer experience. Both TalkTalk and BT have been developing such a solution, but some technical challenges remain. Elsewhere we’re also hearing reports that some BT subscribers are being invited to trial a new “BT Mini Hub” device, which sounds a bit like a WiFi extender. However at present there’s precious little information on this. “it’s been two years since BT’s retail division last introduced a new router during July 2013” – 3 years? Seems like cery impressive specs even if no femocell as some had expected..
Filters can actively transmit and receive a signal rather than just rejecting something unwanted and permitting something that’s wanted? The filter is to prevent ingress from 4G at 2.3GHz impacting wireless performance in the 2.4GHz range. It’s just a filter, the router is not a femtocell. Given that the signal strength (power) is regulated by law, I am at a loss as to how BT can make this claim and get away with it. At least the Talk Talk claims had some kind of testing (no matter how dubious) to try to back up the claim. I guess as i said back then other ISPs have better things to do with their time than waste it on BTs nonsense. I too am interested to know how they are achieving this feat whilst complying with the legal output power regulations. If you have FTTP do you use one of the ethernet ports to connect to the modem and does the new router have a Guest wireless connection? £7.05 extra a month for this and a new 18 month contract, nope. That is a joke right £7.05 a month to what i assume is rent the device or is it over 12 months before you own it at a cost of £84.60? Who in their right mind is going to pay that or buy one outright for £50 when they will be given away to new customers? PS also the spec in the story for the Wi-fi seems wrong, ive never heard of 2.4ghz running at 217Mbps! Anyone confirm specs? 802.11n at 2.4GHz is capable of upto 216.7Mbit/s using 3 antenna and 20 MHz channels. The max speed increases even more if they were to use 40 MHz channels and/or if they have fitted a 4th antenna. If it is using 3 spatial streams then the range is likely to be poor. If that 216.7Mbs figure is also correct i assume the device has no 40mhz? @Colin No idea – I was simply stating that speeds of 217Mbps are possible..
Over on Kitz forum, Sunil Sood, a seasoned BT insider, is expecting it to be another buggy device. Just like its forebear, the BT HomeHub 5a, which reboots or crashes every few days, losing ppp sessions. That’s a euphemism and a half! Lets hope you can at the least this time set a MAC on it and your own DNS…. I doubt it though. Evan – thanks for quoting me (I think) but I would prefer I wasn’t misrepresented. Just for the avoidance of any doubt – I don’t work for BT and never have – thus I am not “a seasoned BT insider”. We will have have to see how the Smart Hub performs before we can make any judgments about it – it’s only just been released so barely anyone has one – though the use of the Broadcom chipsets indicated in this article are a good reason to be relatively positives out its performance. As for ‘needing a few firmware versions before we see what it’s fully capable of’ – I would say the same for any new modem. However, well tested a product is before launch, it generally takes all manufacturers (not just BT) some time to optimise the code and introduce any new features that were not ready to meet initial shipping/launch schedules. This is is not the same as saying I think it will be a buggy device.. The DSL System-on-Chip (SoC) in this device is a BCM63137. In Broadcom nomenclature, the trailing ‘7’ in the part number indicates a budget chipset revision. In this case, the BCM63137 is a cut-down version of the BCM63138. With features removed and/or disabled in hardware. Reportedly all the VoIP and DECT logic has been stripped out; likely other IP modules missing too from the silicon. The BCM63167/8 is a break from tradition for Broadcom which, up until now, has deployed MIPS cores in its DSL SoCs. Finally, Broadcom has moved away from the increasingly obsolete MIPS cores it has been licensing from Imagination Tech. Broadcom, a California-based tech company, is now playing catch up with its Far Eastern rivals, in moving from MIPS to ARM. Chinese DSL chipmaker, Triductor Corp, has been utilising its ARM-based DSL SoC, the VSPM310, since 2013 in both CPE and CO equipment. The Triductor VSPM310 is a 32-bit ARM v7 RISC core from the Cortex series. The core, an SD5610, is licensed to Huawei subsidiary, HiSilicon. So this is an all-Chinese device. The Triductor SoC also has a dedicated FFT module in hardware, for greater efficiency, a critical function in DSL modulation. The Triductor was rolled-out in the acclaimed Huawei HG633 – a device provided as CPE by TalkTalk plc. Being fresh from the foundry, the Triductor goes like stink. Immediately evident from overall responsiveness; especially the embedded web server. It also has a very fast boot time, and runs super cool. And, for us at least, the Triductor is returning appreciably higher sync speeds. Around 10% faster than Broadcom- and Lantiq-based kit. Out-performing the older consumer premises equipment (CPE) which BT and Plusnet continue to supply to their disillusioned punters. I’m very interested in suggestions of names of companies/organisations that would be capable of thoroughly testing and comparing different Wi-Fi routers. Any suggestions? Already the bug reports are flooding in for the BT Smart Hub. Does BT ever test anything properly? The bug reports for the BT Smart Hub are coming in thick and fast now. Mounting problems from multiple issues. The wi-fi regularly dropping out; repeated crashes; random restarts; and getting stuck on boot. Others are reporting that, frustratingly, the Hub keeps losing its configuration and password settings on reset or reboot. As usual, the BT astroturfing community is out in force! Downplaying all these online complaints. With shallow assurances of bug-fixes coming soon. Who believes them? The army of BT sockpuppets are out in force! Determined to salvage the reputation of this lemon-like Smarthub. Pumping out misinformation and false promises, to keep its problems under wraps. Complaints are now pouring in over the sync speeds achieved by the Smarthub. Speeds notably down on other devices. Offering clear evidence that the BT Smarthub just doesn’t pass muster. Like the earlier Home Hub 5, which repeatedly rebooted without warning, is the Smarthub another lemon? Nevertheless one of the aforementioned BT sockpuppets, is keen to pooh-pooh all the critics. Dismissing all these speed problems as being due to the heatwave, he claims, and not the Smarthub itself. Seriously? They really will tell us anything. Just to keep us buying their junk, and our complaints to a minimum! Other buyers complain of feeling cheated by BT. Taking up “personalised” offers for the Smarthub, which gave them the impression of it being “free”. However discovering later that it actually involved re-contracting their BT Broadband; losing them any previous discounts. The Smarthub effectively costing them £72 over the life of the contract. Much more than the device is realistically worth. So lots of different problems with the Smarthub – and not just technical ones. And that army of BT corporate shills working the forums to minimise and undermine valid criticisms. Plus ça change, plus c’est la même chose! I received an e mail offering me a free Smart Hub. ….Not true, they charged me a £50 set up fee because I am an existing customer. I set it up myself and yes it was easy. Once set up it the signal has not been as good as our Hub 5 achieving only fair and poor in our back upstairs rooms. The salesman said I would get a signal at the back of the garden never mind the house. I rang Bt to complain and they said it took about 10 days to be effective. not sure that’s true. Overall I am not happy with this so called innovation or BT’s customer care.I tried ringing again today and the waiting is an hour. I wonder why ? Had been having problems with my old HH5 for sometime with no / poor WiFi performance in 2 upstairs rooms. Paid £7.50 delivery fee and agreed to 18 months more contract (no extra price per month). Overall quite happy – downlink connection speed risen from around 38/39 on HH5 up to 45 on HH6 and about 1 more on the uplink as well. Also no dead WiWi spots in house at all and get solid connection right at the end of the garden. Had it around 2 weeks now and have yet to see a downside. As new BT Home Broadband (copper, not Infinity) customers, we were offered the Smart Hub for £50 as part of the sign-up process. Then, when the speeds were reported as less than satisfying, i.e. o.6 Mbps, BT Technical Team stated that the Smart Hub (Hub 6) was incompatible with copper wire broadband and we would need to be sent a Hub 3 or Hub 4! Can this be right? Tell me it’s not right! My BT Home hub 6 (Smarthub) is also constantly rebooting (at least once a day) and I continually am finding it in orange light status and not blue. It does eventually reboot itself and then work. Sometimes it gets stuck on reboot and never gets ready so I have to restart it manually. Sometimes it is in “Blue light status – but there is no internet connection, so it has to be rebooted again. The claims that the coverage would be better have not so far proved too. For me, it has been £57 wasted. I am disappointed with the BT Home hub 6. I am hoping it will “settle down” after 10 days as some on here are saying. COuld it be the smart features that are causing it to reboot itself? Think we will be seing BT dragged on to shows like Watchdog or RipOff Britain. Something has went dreadfully wrong and the BT people have just totally lost it. I think they did a firmware update which went bad and they’ve now let it steamroller away – totally out of control. I endured 3 weeks of misery before reverting back to the bliss of the old Homehub 5. Go to BT community – pages of users with issues. BT Smart HH6. It appears to have 4 ethernet ports as standard. We’ve got FTTP. BT say port 4 can also become a WAN port seemingly achieved by putting a red sticker over the number 4. Can this really be the case? I spent an age on the phone and eventually a BT tech guy said there are 2 versions of BTHH6. The one with the red sticker has port 4 set up as a wan port ready to receive the output from the white Openreach fibre box. Has anyone out there had experience of this and does it work? The Smarthub definitely does not live up to its name- it kept dropping connection on several devices and requested password entry each time. Also the signal around my house is weaker than with my Home Hub 3 & Openreach devices which I have now re-installed. I’m fighting with BT for a refund of the £9.99 which I wasted on this useless product. I have also received sseveral smart hubs to improve my wi fi connections which until today were not able to resolve. My wi fi connection is worst in the UK than in South America which is disappointing.